You can return a successful payment directly from your Merchant Profile. Other methods include setting up or performing them manually, by payment order. For making a refund, you need to link your phone number with your Merchant Profile. Two types of users: owner and administrator. Both will need access to the linked phone: we will send text messages with passwords for confirming operations. You can only refund successful or partially returned payment. Refunds apply other restrictions, too. Check whether a payment may be returned in the list of . One payment cannot be returned twice. But if you make a partial refund and repeat this refund later by mistake, both refunds will be executed: the necessary and accidental ones (if their sum is less than the whole amount of the payment you make the refund for). Find the required payment in the history. Payments with the Success status have an arrow with the Refund hint next to the amount. Click it and the Chargeback block will appear. If you do not have a phone number linked to your Merchant Profile, we will ask you to link it. Do this in the Managing your account section. 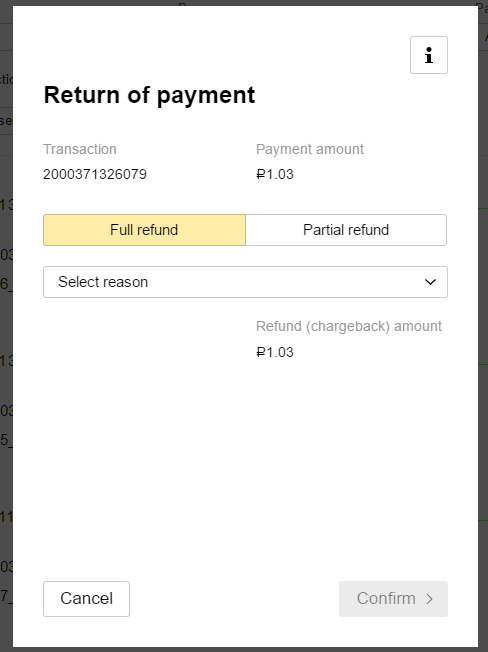 Select the reason behind the refund from the list and specify the amount in the Chargeback block: entire amount for a full refund, part of the amount for a partial refund. Click Confirm, enter the password from the text message (sent to the linked phone number), then click Next. That's it, your refund request has been sent. After successful processing, the payment status will change to Refund or Partial refund. You can only make a full refund in here, either one or several at once. View the Refunds tab in the Transactions section. If you do not have a phone number linked to your Merchant Profile, we will ask you to link it. Do this in the Managing your account section. Click Make refund to open the refund request form. Select the reason behind the refund from the list and specify the payment ID from the history. If you want to make several refunds, click Another refund. 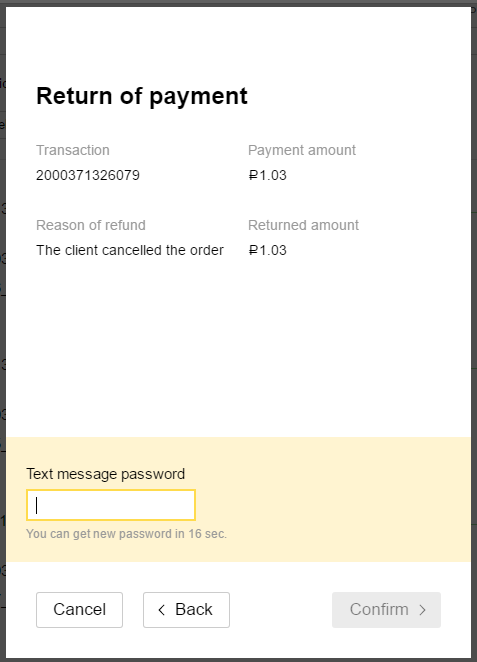 Click Confirm, enter the password from the text message, then click Refund the money. That's it, your refund request has been sent. After successful processing, the payment status will change to Refund. All your refund requests are stored on the page with the list of requests. Refresh the page to check the request status. The status will change in the case of a successful refund. If something goes wrong with the request, an error message will appear below it. You can also find the required payment in the history by the payment ID (indicated in the request). If the refund is successful, its status will change and the transaction history will be added to it. Refunds usually take several seconds. But the list of payments may take time to update: wait for about twenty minutes, then check. Внимание. You cannot cancel your request for a refund. If you made a request and the refund is allowed for this payment, money will be returned to the user. If the refund is performed on the date of the payment, it is commission-free. If the refund is performed later (after midnight by Moscow time), you will need to pay a standard commission as for a successful transfer.